Determination is the key to accomplishing your goals and dreams and Ben Baltz proves it. 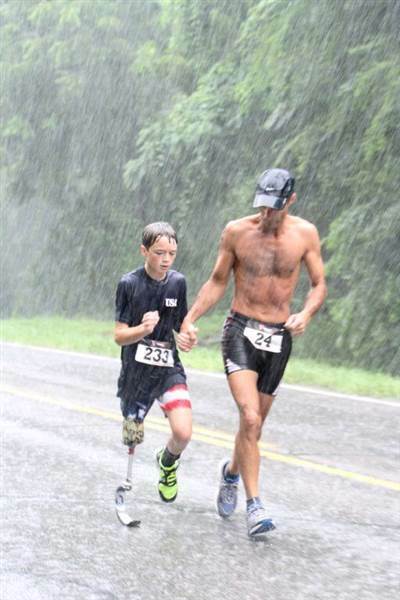 Originally submitted to the Runner’s World cover photo contest by his sister, this photo has recently gone viral but it is not because of the elements this father and son duo were battling during a triathlon. It showcases the strength, courage, and determination Ben Baltz has in order to finish what you put your mind to. This is not the first triathlon for Baltz. He has been competing for a few years and even was featured in this clip of him finishing a triathlon back in 2012. But the story behind the photo is the determination that this 14-year-old has had since the moment he learned he would have to amputate his leg. At the age of 6, he was diagnosed with osteosarcoma and his parents learned that he would have to lose his leg. Worried about adjusting to a new type of life, Ben didn’t let it slow him down. He became a beacon of hope and inspiration for other amputees and cancer patients to live happy, active and fulfilling lives. But he doesn’t just do it during his races, he also takes the time to visit newly diagnosed osteosarcoma patients as well as recent amputees. He helps them come to terms with their lives, the changes and how it shouldn’t prevent them from stopping what they enjoy. Cancer is a diagnosis nobody wants to hear, but Ben isn’t letting what it did to him, stop him from doing some good in this world. It also isn’t letting him stop doing what he enjoys including baseball, running and, of course, triathlons.